The President presides over all board meetings, sees that resolutions of the Board are carried out, and represents NCWCA to WCA National, Regional WCA chapters, NCWCA membership and to the community. The Secretary ensures that minutes of all meetings are maintained and placed in the minute books, and non-profit incorporation reports, forms, documents, and fees are filed on time. The Treasurer handles all financial accounts of NCWCA, including prompt and accurate accounting of all income and disbursements, and preparation of the annual financial report. The Treasurer ensures that all applicable Federal and State taxes and tax reporting are complete and 990N form is filed on time. In addition to Officers and Board Members, NCWCA has a non-voting Advisory Committee which in accordance with by-laws have no voting rights but act in an advisory capacity to the members of the Board. The purpose of the Advisory Committee is to assist the members of NCWCA's Board of Directors in furthering its goals as an arts-activism and educational 501(c)(3) organization. All Past-Presidents in good standing are automatically nominated to serve on the Advisory Committee. Retiring Board of Directors members in good stand as well as women from the larger community may be invited to join the Advisory Committee by the Board of Directors. The Communications Chair distributes NCWCA Chapter and member news, activities and announcements to NCWCA members and to the general public via email, social media, NCWCA website, newsletter, and written mediums. The Professional Development Chair facilitates the ongoing professionalism of the NCWCA chapter through educational, leadership and networking activities for NCWCA members. 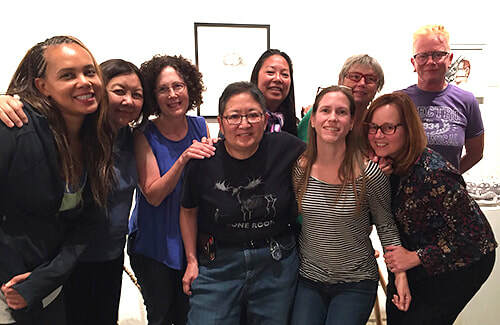 At least annually the Professional Development Chair leads the NCWCA Chapter in a professional activity that supports art activism and is beneficial to the community within the chapter’s geographic area. The Exhibitions Chair facilities the ongoing professionalism of the chapter and its members by offering visual exhibition and curatorial opportunities to its members and the community at-large at least once every two years. The Art Historian in Residence helps the organization document historical and trend-setting women’s art by publishing essays and critiques in publications such as exhibition catalogs, textbooks, educational journals and magazines and provides critical analyses of art activist endeavors undertaken by the organization. Up to three NCWCA members may be elected by the Members of the Board of Directors who, in the opinion of the Board, have skills that will enhance and further the objectives of the board.